About a decade ago I came to the National Institutes of Health (NIH) to work with my mentor, Jeff Baron, to study childhood growth and to tackle one of the unsolved mysteries in biology – mechanisms for body size determination (1). Years have passed, and we probably still don’t understand what makes an elephant an elephant. What we do know is that body growth happens for much longer period of time in an elephant than in a mouse, which contributes to it being bigger. Body growth slows and eventually stops in all mammals, and we think that what regulates the timing of “growth deceleration” holds the key to understanding the mechanism for body size control (2). Growth does not only slow with age in soft tissues. The bones that constitute our skeletal system – more than 200 of them – also grows quickly in young children but gradually slow with age. It has been well-established that longitudinal bone growth is driven primarily by the growth plate – a small piece of cartilage tissue found near the ends of our long bone. As you grow taller, your growth plate also gradually becomes thinner and thinner. Eventually, all the growth potential in your growth plate became exhausted, and that is when growth plate fuses at around 20 years of age for most people and when linear growth stops. 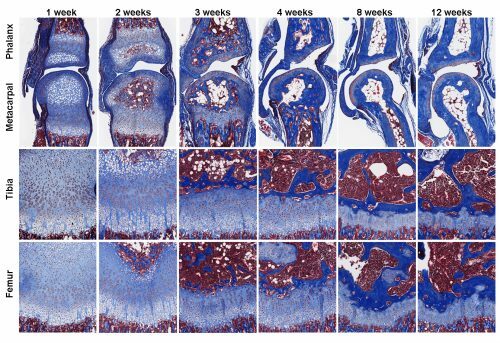 We call this age-related deterioration of growth plate function that limits bone growth “growth plate senescence” (senescence is another word for aging). Before and right around the time I joined the group, Jeff and other colleagues were studying the expression of different paracrine signaling pathways in the growth plate (3) using a new (at the time) technique called growth plate microdissection. The growth plate has an interesting and elegant spatial arrangement. 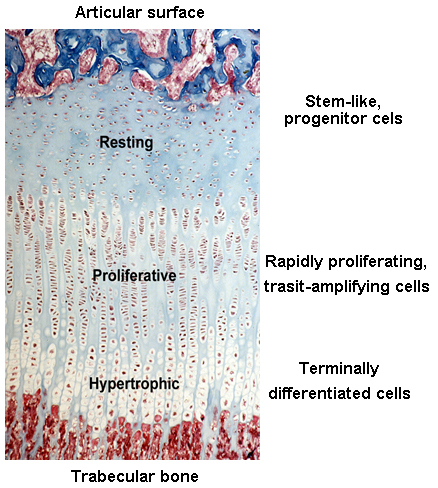 From one side of the growth plate (closer to the joint surface) to the other (closer to bone marrow), cells in the growth plate called chondrocytes gradually transition from progenitor cells (in the resting zone) to transit-amplifying cells (in the proliferative zone) and finally becomes terminally differentiated cells (in the hypertrophic zone). This cellular transition contributes to the expansion of cartilage tissue and subsequent bone growth. Chondrocytes at each of these zones have dramatically different gene expression profiles, which is fundamental to their corresponding cellular functions. Before then, most of the studies elucidating the changes of gene expression across the growth plate were done by performing in situ hybridization or immunohistochemistry, interrogating expression of one gene at a time. These techniques are however semi-quantitative at best and could be prone to false positive results. Technically, the only way you can be sure the immunohistochemistry signals are real is when you do it in a knockout mouse and the signal disappears. Ola Nilsson, a fellow in the lab at the time and a good friend of mine and now professor at Karolinska Institute, was developing a technique called growth plate microdissection. He would make frozen sections of the rat growth plate and cut it with a razor blade under an inverted microscope into different zones, one slide at a time. It was a game-changer because that allowed us to extract RNA from different growth plate zones to study gene expression using qPCR or microarray. This technique has its downside of course, as it requires steady hand to make precise cut on tiny tissues, extremely long day (you need to combine 40 dissections for each sample), and occasional inhalation of xylene vapors (because you need to keep the tissue on the slide in xylene when you cut). Nevertheless, over the years, this technique led us to many interesting discoveries, like the regulation of bone growth by growth plate senescence (4, 5). In addition to body size control mechanisms, Jeff and I were also wondering how different bones in our body grew to different lengths to achieve skeletal proportions. How does the left and right leg always grow to (almost) the same length (6), and what makes the finger bones so much shorter than the leg bones? We have a hypothesis that maybe senescence in the growth plate are happening at different rates in the longer and the shorter bones. However, to test this hypothesis, we want to compare the gene expression between growth plates from the leg bones and the finger bones, which are way too small to dissect using our method. And even if we were able to dissect the finger growth plates, it would take many animals to get enough RNA to study at the time. Luckily, remarkable advancement in sequencing technology in recent years significantly reduced the amount of starting material needed for whole transcriptome interrogation. More importantly, a few years ago I met two gentlemen from National Cancer Institute, Jaime Rodriguez (now at MD Anderson) and Jeffrey Hanson, who taught me all about laser capture microdissection (LCM). LCM is a much-improved version of our original microdissection method, because now it is relying on the machine-controlled laser, rather than my shaky hands, to make the cut. After years of optimization, we can now isolate cells from much smaller tissues, such as the growth plate zones from mouse proximal phalanx, for RNA extraction. We have achieved what was (to us) seemingly impossible few years ago, using RNA-Seq to compare zonal expression profile between the leg bones and the finger bones. 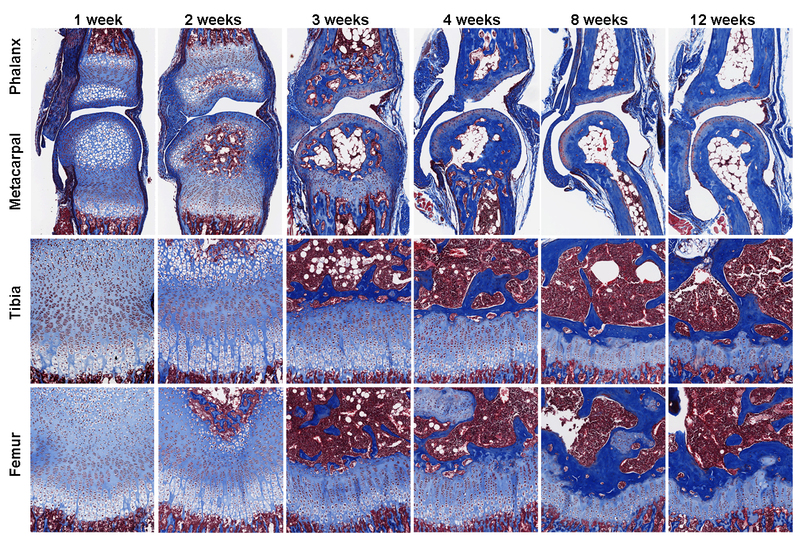 Our findings, which was published recently in PLOS Biology (7), showed that growth plate senescence is more advanced in shorter bones than in longer bones, and this differential aging contributes to the disparities in bone growth. Our RNA-Seq data showed that the molecular mechanisms that underlie this differential aging between bones involve differential expression of signaling pathways between longer and shorter bones, such as IGF1, BMP, and WNT signaling, which regulate cell proliferation/differentiation in the growth plate. We are currently trying to understand whether differences in bone lengths between different species are also attributable to similar difference in growth plate senescence. To find out more: Lui et al. (2018) Differential aging of growth plate cartilage underlies differences in bone length and thus helps determine skeletal proportion. PLOS Biology16(7):e2005263.